Picture this: a wild and wildly famous adventurer, a bachelor whose home is comically large on the inside and stuffed wall-to-vault with treasures from this world and beyond, an indeterminately age’d (but brilliant!) elder who lassos enthusiastic youths into accompanying him on even more adventures, a figure beloved in pop culture going on generations. He’s known for his sartorial sharpness. He may be Scottish. Oh, and he is also super rich. Sorry, Tenth Doctor! Incredibly, it turns out I wasn’t actually talking about you! I was talking about David Tennant, though, whose casting as Scrooge McDuck in Disney’s reboot of DuckTales is, as the Tenth Doctor would say, brilliant. Tennant is a terrific voice actor regardless, but the added layer of bringing an actor in from one classic “adventure across the generations” to revive another highlights just how thoughtful the DuckTales 2017 team has been about every aspect of the reboot—from the theme song to the rest of the voice casting to the nostalgia-scratching nods to Scrooge McDuck’s long animated and comic history, nothing in the reboot has been overlooked. All this to say, if you, an adult, are planning to tune in to DuckTales once its first (new) season kicks off in earnest this Saturday, you will not be disappointed. You may, however, be baffled by the Disney XD programming your old new favorite show is tucked up next to, so baffled that you may not want to stick around any longer than DuckTales takes to air. But that would be a mistake! Insofar as any portion of your television viewing is budgeted for pure escapism, Disney XD (and Disney “classic”) has as much or more to offer than any HGTV/Food Network/TLC/ESPN. Naturally, there are some duds—or, maybe more accurately, some series that are only ever going to be beloved by actual kids—but for the rest, allow me, also an adult, to guide you through the most interesting. I wasn’t kidding when I invoked ESPN: this summer, Disney XD handed a large chunk of its daily (and late-nightly) programming over to Disney XP, which is like IGN-meets-G4-meets-YouTube, focusing on games, tech and esports. G4’s old Attack of the Show has been reincarnated here as The Attack, and any given night will offer at least one multi-hour block of some eSports World Cup. If any/most of that sounds like your thing, great! Literally turn your television on after 9 p.m., and you’ll get something you’ll like. Waypoint Presents is a fascinating documentary series created by VICE that follows gamers of every type, terrestrial and virtual, and aims to answer in 30-minute chunks the question of “how and why we play games.” The topics covered so far include one of the greatest modern eSports rivalries (which also taught me that Rick Fox is an eSports franchise owner), Magic: The Gathering through the generations, competitive speedrunning, and LARPing; still to come this season are a handful of equally compelling topics, including a profile on Angela “Overkill” Hill, an MMA fighter who uses cosplay as part of her training. Speaking of eSports rivalries, apparently there are eSports rivalries! Apparently, also, more people tuned in to the 2015 League of Legends World Finals than tuned in to the 2016 NBA Finals. As a person whose secret lame superpower is looking away from the key play/moment/twist in any sports game, ever, I’m not going to beat myself up over an utter inability to keep track of a dozen video game characters clashing across an ever-changing screen. But! The fact of this explosive industry is compelling enough, so whether or not you tune in to Disney XP for the actual Overwatch World Cup, don’t play yourself by writing it off. And don’t let the industry play itself by writing women off, either. As far as we should all be concerned, eSports for everyone (but me)! One of the things Disney’s live-action shows do best is take formulas that may have grown stale on network television and boil them down to their most effective—in fact, the writers on these shows often come from network television juggernauts. In many cases, this essentializing lays bare the goofiness inherent in any scripted television that follows a formula, but… that’s kind of great? Television can be so goofy! I don’t see any point in trying to pretend that the goofiness of adult network programming is any better or inherently more worthwhile than the goofiness of the exact same programming starring and marketed to kids. Network formulas that seem fresh and edgy now will eventually age, and when they do, Disney and Disney XD will gladly pick up where adults left off. The only live-action series running concurrently with DuckTales is Mech-X4, which plays like a cross between Person of Interest and, I don’t know, Quantum Leap. Or it’s Transformers with mood lighting and relatable characters, or Voltron, but live-action and not in space. The show centers on “technopath” teen Ryan Walker (Nathaniel J. Potvin), who uses a combination of his technopath powers, an indoor bungee set-up, and the wit and wisdom of his adoptive brother, two friends, and an eccentric Doc-Brown-esque scientist to control a giant robot. Like the other good live-action programs over on Disney “classic” (see below), Mech-X4 is completely self-aware and un-self-serious, but it doesn’t let that stop its ambition. It is warm and funny and fun, has a really nice focus on male friendships and brotherhood, and is so easy to drop into in seriem res, here in Season Two. Give it a shot! If you’ve turned to Disney “classic” anytime in the last few years looking for animation, you may have come away disappointed. The flagship network has a few great animated series running right now—namely Tangled, Hotel Transylvania, and some highly stylized Mickey and Minnie shorts—but for the most part, once Disney XD came into being, original animated series, including anime-imports like Pokémon and Beyblade, moved over there. While not as notoriously audacious or mature as some of the hipster darlings from Cartoon Network, the animation slate on Disney XD still has plenty of gems, and in a wide variety. Star vs. the Forces of Evil is, as far as I’m concerned, the best animated series the network has going for it—it is weird and metal and fluffy and so immensely fun. Star Butterfly (Eden Sher, playing The Middle’s Sue Heck turned up to eleventeen), a magic-wand wielding, heart-cheeked, devil-horned, spiked-boot wearing princess from another dimension, is sent to Earth by her parents as both punishment for playing too loose and fast with magic back in her home world, and as a kind of cultural exchange. In a series of events that are more than highly improbable, Star takes up residence with a local nerd, Marco (Adam McArthur), and his very enthusiastic parents. Then, the two of them start fighting monsters. The monsters attack often, as their leader, a truly disgusting bald little bird name Ludo (Alan Tudyk), is obsessed with stealing Star’s wand. Michael C. Hall and Jeffrey Tambor join the cast in Season Two in roles that stretch the imagination even further. Jenny Slate plays a floating unicorn head with a wild side. It’s wild. If you loved Phineas and Ferb, this one, which is the creative follow-up from Phineas and Ferb creators Dan Povenmire and Jeff “Swampy” Marsh, is quite literally made for you. (And if you didn’t love Phineas and Ferb, see below!) It is especially made for you if your favorite part of Phineas and Ferb were the increasingly unlikely ways in which Phineas and Ferb’s daily inventions were whisked into non-existence at the very last minute, like clockwork. In Milo Murphy’s Law (playing off the Murphy’s Law maxim that “Anything that can go wrong, will”), those last-minute unlikelihoods are the entire subject, and Milo (Weird Al Yankovic) is the hapless jinxed teen who miraculously survives in spite of every actual odd. Like in Phineas and Ferb, everyone in Milo’s orbit plays with a bemused world-weariness, and most of the best humor is visual, dependent on very precise context, often employing boldly long silences. Were you endeared by Jim Halpern’s silent stares directly into the camera? That is like a full 30% of how any given pair of characters interact with each other while Milo is on screen. The other 70%? Wit so dry it’s brut. Plus, Weird Al! The newest animated Spider-Man series begins with two cops hunkered down behind a squad car, one complaining about missing the days when thieves stole money, the other—I’m not joking—exclaiming in return, “Where you been? SCIENCE is the new currency!” Several episodes later, Spider-Man pauses mid-fight to calculate the trajectory needed to web-slingshot his way out of danger, then crows, “And THAT’S the power of geometry!” It is delightful. Not as delightful as Tom Holland’s stab at the newest live-action version of Peter Parker’s world, but delightful enough to sit down with over laundry. Plus, like Mech-X4, it focuses nearly as much of its running time on the mechanics and importance of male friendship as it does on high-flying action. It does include the origin story that the movie-going world is so tired of by this point, but one can imagine that there are kids too young for the Marvel cinematic universe watching for whom that story is fresh. Which, speaking of—of all the options at hand, this is definitely near the top for shows to watch if you have a young kid in your life with whom you struggle to make conversation, or with whom you ever have to kill time. It is exciting, but not scary, and obviously lays the groundwork for a whole universe of conversation further down the road. Both of these shows were flagship series for Disney XD within the last few years, and while they’ve completed their runs, episodes and mini-sketches are both live on the XD app and still regularly included in the network’s weekly line-up. As the DuckTales episodes will be re-airing regularly throughout the week, it is entirely likely that you will come into contact with one or both of them when you are tuning in for your nostalgia fix (and if not, you should still seek them out). Correctly hailed by Tor as “the best science fiction on television,” Phineas and Ferb is the very definition of smart storytelling for children. Premised on the simple concept of two precocious, scientifically-minded pre-teen stepbrothers setting out to make every day of summer the best day of summer, it just oozes love for science and innovation and positive thinking and problem solving, plus it lets adults have real, flawed personalities and complete lives (and histories!). There’s also an incompetent mad scientist, a secret agent ring populated only by animal spies, and a smart new song written for every episode, nearly all of which are earworms. Like Milo Murphy’s Law, it depends heavily on silent visual jokes (there’s a scene in which the mom is drying a human skull while doing dishes and having a conversation, and no one ever comments on it), and on clever and deadpan use of language and factual knowledge (there’s a joke about astronauts in a NASA shuttle that is chef’s kiss). It also employs like five hundred A-, B-, C-, and D-list actors and guest voices, so if aural Where’s Waldo is something that appeals, you’ve got 130 episodes (200+ if you count each 15-minute chunk) to test your ear. This is one of those shows that will stand the test of time for kids who grew up with it—go ahead and be the cool aunt/uncle/cousin/neighbor/babysitter who knows what’s up. The one downside of Disney XD is that it is very obviously coded as “for boys.” It isn’t only for boys, of course, but between the subject matter (robots, eSports, monsters, science, pranks) and the central protagonists of each series (all boys, except for Star Butterfly), it can feel pretty punishing and/or regressive for anyone looking for some gender balance. Thankfully, Disney “classic” is one click away, and its entire slate, for better or worse, skews the other way, both in terms of subject matter—mostly friendship! But also magic and family—and who ends up as central protagonists—all girls, except for Booker (Issac Ryan Brown), on the other nostalgic reboot Raven’s Home. Just like with Mech-X4, all of the live-action shows have familiar roots in the television of old—although, in some cases, the “old” is not necessarily multi-camera network sitcoms (Bizaardvark, Best Friends Whenever, Liv and Maddie, Raven’s Home, Girl Meets World), but the single-camera Disney Original Series from millennials’ youths, like Even Stevens and Lizzie McGuire. 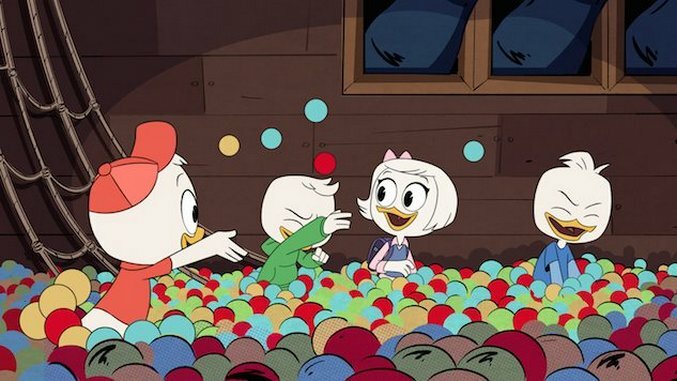 While all of these are solid escapist picks, the three best that are likely to be running before or after you are tuning in for DuckTales are Stuck in the Middle, starring the indomitable Jenna Ortega (Baby Jane from Jane the Virgin!) as inventor, mastermind, and middle child of seven in a wild (Latinx!) family; Bizaardvark, starring Madison Hu and and Olivia Rodrigo as best friends who run a weirdo comedy-song Vuuugle (basically, YouTube) channel; and the aforementioned nostalgia trip of Raven’s Home, which stands up on its own, but is simultaneously even more of a cathartically goofball fulfillment of this thirtysomething’s television wishes than even GMW 2.0 was. Of course, you could always just watch DuckTales on repeat. The reboot is REALLY great. Season One of Disney XD’s DuckTales premieres Saturday, Sept. 23, at 8:00 and 8:30 a.m. This block will repeat at various times throughout Saturday and the following week.